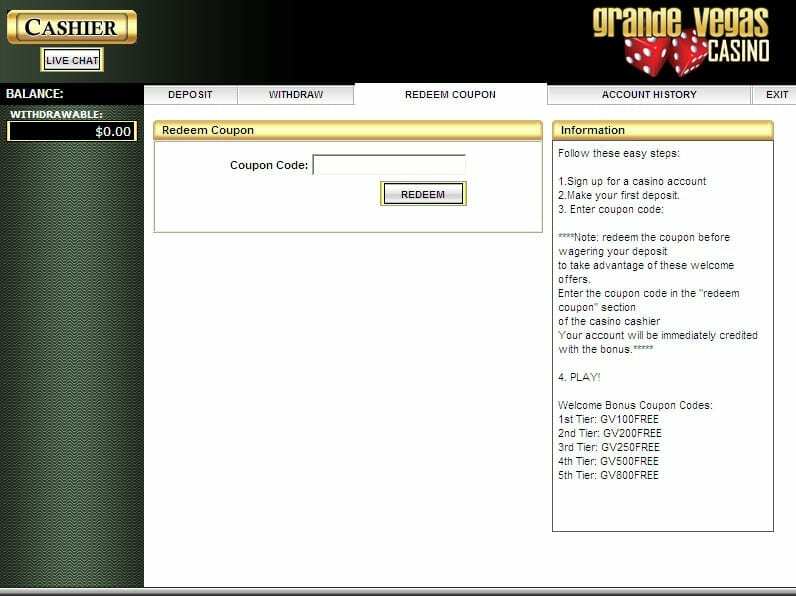 Grande Vegas Casino no deposit bonus codes 2019 - 50 Free Spins ! For fast payouts, exciting bonuses, and enjoyable game play, check out Grande Vegas Casino. Although the casino is available in French and English versions, the only currency accepted at the casino is American dollars. It is home to a fascinating assortment of slots, video poker, and table games, creating an exciting venue for gamblers of all skill levels. One of the surprises presented by the casino is that its license comes from the British Virgin Islands. The registration process is quick. Simply complete the form with your contact information. The casino does have a statement indicating that it follows up on your identity details in order to check their veracity. 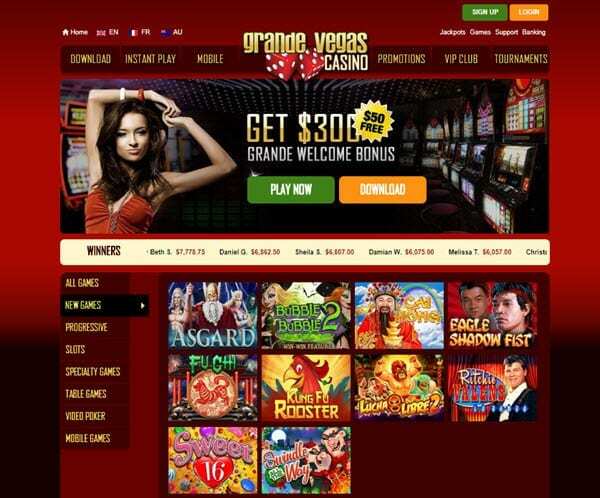 RealTime Gaming, the force behind Grande Vegas Casino, delivers instant-play and downloadable versions of its games. 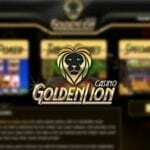 You can take the time to install the casino games or play them instantly through your web browser. One of the perks of taking a few moments to download the software is that you get access to a larger selection of games. Numerous opportunities await players looking to cash in on the added fun delivered by a variety of bonuses. You can enjoy a welcome bonus when you first sign up and keep dipping into extra money piles as you continue to frequent this gaming experience. 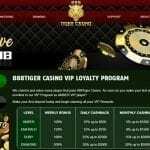 For some reason, the owners of this casino enjoy splitting each bonus into several levels, making it necessary to enter a new code at each level. The $300 Welcome Bonus is split across your first three deposits. A different code must be used for each piece of this bonus. The initial deposit receives a 100% match up to $100. The second deposit receives a 150% match up to $150. The third deposit receives a 50% match up to $50. Players must complete this bonus in the proper order to access each option. The $200 Grande Rewards Bonus provides up to $200 over three deposits along with lots of free spins. Your initial deposit gets you a 100% match up to $100 plus 25 free spins to be used on Bubble Bubble. Your second deposit gets you a 100% match up to $100 plus 25 free spins to be used on Lucky 6. Your third deposit gets you 50 free spins to be used on Achilles. The heart of the loyalty program is the ability to earn comp points while you play. The number of points you can earn varies by the game you are playing. For some games, the trade off is steep, and you need to get to 500 credits for a single point. The trade off is much better on slots, and you can earn one comp point for just ten credits. Comp points accumulate quickly since Grande Vegas Casino doesn’t limit the opportunity to earn across its entire collection of games. It simply modifies how many points you can earn per credit. For every 200 comp points earned, you get to claim one dollar. While the majority of games includes mostly slots, table games and video poker options are plentiful. If you want access to the full collection, you need to download the casino onto your computer. Most players like to place deposits and make withdrawals using a preferred method. If you are one of them, you won’t be disappointed with the options at the Grande Vegas Casino. Your options include credit cards, digital wallets, debit cards, and a number of money transfer methods. No fees apply, which means you get to play with all of the money you deposit. Withdrawal options aren’t as user-friendly as making a deposit. The results aren’t immediate and limitations apply. In most cases, withdrawals take as long as 24 hours, and in some cases, even longer. Wire transfers and courier checks take the longest. It’s important to check the exact numbers for minimums and maximums before making an attempt to deposit or withdraw. These numbers depend on the method being used to deposit funds or withdraw them. If you intend to spend hours gambling online, it makes a lot of sense to check out what your support options are before selecting your casino. Getting the answers quickly to the questions you have is critical if you want to enjoy a pleasant experience from start to finish. The support staff at the Grande Vegas Casino respond in French or English. Members can reach them using live chat, which is the quickest option. If you aren’t comfortable chatting online, you can also send your query through email or call on the phone. Players from the United States can use a toll-free phone number, a nice feature that you won’t find at all casinos.